Grilling lobster tails is my new favorite way to cook lobster. I've always loved lobster, since I was a little kid! Boiled lobster, steamed lobster, lobster sashimi, you name it! But ever since I had grilled lobster at a little seafood restaurant in Cozumel, Mexico I have been searching to recreate those amazing flavors! And I've finally nailed it! 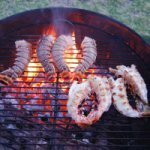 I wanted to learn how to grill lobster tails but started out simple and it was perfect. The amazing flavor of lobster speaks for itself, but just with a bit of coaxing, grilling lobster tails takes it to a whole new level. Smokey, rich and buttery, this lobster recipe has it all. And its simple! I have to say, my wife generally doesn't like lobster. Something about it clashes with her tastebuds. She generally much prefers crab. However, after tasting this grilled lobster, she said rather matter of factly, "That's the best lobster I've ever had." Nuff said. Lobster tails: Most markets sell individual lobster tails you can buy alone. If they aren't available you can always buy whole lobster, cut the tails off and reserve the rest for something else. If you prefer to use live lobster, they should be first quickly boiled, dunking them head-first into a big pot of boiling water for a few minutes. They can then be drained and cooled and the tails separated. Tequila, 1 tbsp: This is optional but really kicks up the flavor in my opinion. Don't worry, the alcohol burns off. First, before grilling lobster tails bring the lobsters to room temperature. Split the tails down the middle. 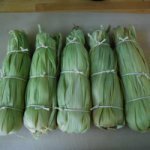 You can either do this with a large chef's knife or cleaver, pushing the end into the thin tail end and then using the heel of your hand to push down and split the rest of the tail. If the shell is too hard to break through in this manner, you can use a heavy duty kitchen shears to cut down the length of the tail, separating the shell and meat into two halves as pictured below. From the end, that would be nearest the body, gently pull the lobster tail meat out from the shell. Do not pull it out completely, just leave the very end attached at the tail end. Next, prepare your basting butter. Melt the butter (in a microwave is fine) just barely so that it is soft and can be mixed easily. It should not boil and does not need to be very hot or completely liquid. Stir in lime juice (or lemon if you prefer), tequila, garlic and salt and freshly ground black pepper. Mix thoroughly. You can taste and adjust the salt, pepper and lime juice as you feel appropriate. It should be well seasoned because this is all the salt you will be adding to the grilling lobster tails. If the butter starts to harden at all while you are getting ready to cook, just microwave the bowl a few seconds to keep it soft and a pourable consistency. When your grill is ready, use a basting brush or spoon to coat the lobster tail meat on all sides with the basting butter, including getting some inside the shell. Carefully push the tail meat back into the shell. Place the lobsters on the grill, flesh side down, over high direct heat. Cook for a few minutes just until you get some nice grill marks on the flesh. Don't leave them alone for too long as they will cook and burn fast if you don't watch out! Flip the grilling lobster tails onto their shell side slightly off the direct heat. Immediately baste with abundant basting butter. Grill several minutes more, basting frequently. Over the cooking period you should use up pretty much all of the butter mixture. You can cover the lid between bastings to help hold in heat and aromatic smoke (especially if you are using any smoking woods). The tails, if average size, should only take about 10 minutes total (including both sides). You just want them to turn opaque. If you cook too long they will start to get chewy. Once done, simply take them off and serve up! They are already delicious but if you prefer to serve with more drawn butter and lime wedges, so be it! Enjoy! 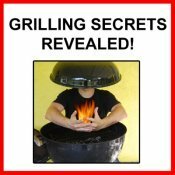 Done with the Grilling Lobster Tails page? 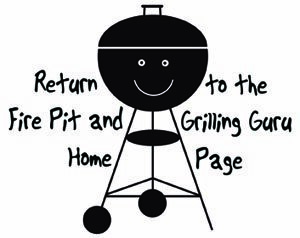 Return to the Barbeque Grill Recipes page.